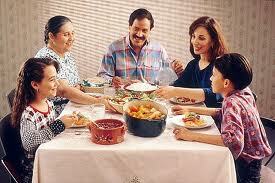 One of my fondest memories growing up was family dinners. Every night we sat down and ate dinner together – all six of us. No matter if any of us had the best or worst day at school or work, we would stop to share food together. It wasn’t simply eating dinner together that was remarkable, it was what my parents did with this opportunity of having us all together. They created a positive and nurturing environment while modeling priceless life skills: love, social skills, and healthy eating habits. Although there were many times I wished our family was one of the “cool” families that ate dinner in front of the TV, now as an adult and parent I recognize the importance of having family meals. Don’t get me wrong, our family dinners were far from perfect. Sometimes they were disasters, but they did provide important messages.